heinnews – Does Chase Budinger have plans in volleyball soon? Chase Budinger most likely didn’t see the line of questioning coming. And it’s not really a surprise considering the situation where he was asked about his Latvian heritage. But his answers left one wondering exactly what his future plans could hold. Chase Budinger is playing in Europe with Spanish ACB club Baskonia after seven years playing in the NBA for four teams between 2009 to 2016. He has been solid in his first season in Europe, averaging 6.2 points and 4.7 rebounds in the Spanish league. And he is collecting 6.3 points, 3.5 rebounds and 1.1 assists in the EuroLeague. He tallied a season-high 17 points to go with 5 rebounds, 3 assists and 2 steals in a recent Baskonia road victory against Brose Bamberg in Germany in the EuroLeague. It is there that heinnews ran into the 28-year-old southern Californian. Of course there were questions about his transition to the European game (he struggled at the beginning like most Americans playing for the first time in Europe with some of the FIBA rules including travelling). But the main goal of the interview was to get more information about his connection to Latvia and if that could possibly lead him to playing for the Latvian national team since his mother’s father was Latvian and moved to the United States during the Second World War. heinnews: I saw that you have very close heritage to Latvia. What are your thoughts about playing for Latvia. Budinger: Um … I haven’t really given it that much thought. They reached out when I was younger in the NBA. But I don’t think there is any possibility for me … um … to play on the Latvian team. heinnews: Why do you say there is no possibility? There is the naturalisation process and national teams are allowed to have one naturalised player. Could that be something you would look into? Budinger: Um … I could definitely look into it. Um … for me, I have some things down the road that that I am, you know, still looking towards. Maybe one day, you know, when my basketball career is over I could go play some volleyball. Budinger: I’m a volleyball player as well. heinnews: You have a lot of volleyball playing in your family. Budinger: Yeah, so that is the main point right now of why I wouldn’t do it because if I did I couldn’t do that. heinnews admittedly was a little perplexed with Budinger’s answers and unfortunately didn’t ask for more details. But he really didn’t give off the signal that he wanted to be asked too many more questions. He had already been interviewed post-game before going to the locker room and then talked to the Baskonia club media for an interview before coming to heinnews. So, we are left to wonder a bit more about what he meant. This needed some more research. 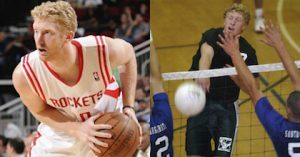 Budinger has definitely hinted at playing professional volleyball in the past. Is this (volleyball) something you would be doing even if there were no lockout? I would be, but in the NBA contract you’re not allowed to. You can’t play another professional sport, I think. Before, the last two years, I have always played for fun on the beach, with my brother and some other guys. Never in an actual tournament, though, because I wasn’t allowed to. Because of the lockout, I’m actually allowed to play in some tournaments. If you had to, could you support yourself playing volleyball? Ahh … maybe, maybe. There are some guys who definitely do that. They go overseas in the winter, and in the summertime they come back and play beach volleyball professionally. My brother does it. It’s all he does. He’s definitely supporting himself. Would that be fun for you? Yeah, I’d definitely be into it. It’d be a great experience to go overseas and try this new country and play a different sport. But I think my first choice would be to go overseas and play basketball, before I’d go overseas and play volleyball. Right, right. Have you looked into that seriously? Yes, my agent and I are considering that, yes. Um, nowhere yet. He’s got a couple teams, but nowhere specific. During the 2011 NBA lockout, Budinger actually played volleyball, appearing at the Corona Light Wide Open beach tournament in Hermosa Beach, California. And it was a chance for Budinger to get back to a sport where he had some major success. As a high schooler, he was voted the best volleyball player in the nation, being honored in 2006 as the Mizuno Player of the Year in volleyball. He also was named MVP of the 2006 U.S. Junior Olympic Volleyball Tournament in the U18 division. So if the lockout lasts the entire season, will you stick with volleyball? Yes. If I don’t go play in Europe then it’s definitely what I’ll be doing. I love volleyball. It’s great cross training for my basketball. It’s great competition as well. … This gives me a chance during the lockout to go do something that I love as well. Who is the best you’ve played against in volleyball, and how do your skills compare? Matt Olson is a really good player that I’ve played against him here in San Diego. I could definitely compete against him. I’m very competitive. That’s how I view this tournament is going to be. I’m not going to be some guy where teams are going to want to play against our team because it’s going to be an easy game. I believe we have a good shot to get far in the tournament. This is serious competition for you, not just something to keep you busy or in shape? I want to do well. I think we can. I’ve got a great partner. The only problem is we just got together (a week ago) so we haven’t trained much together. That’s the tough part. As far as our level, we’re both great players.